Lejos de tener un Lamborghini o un casa enorme a la orilla del mar, uno de mis más grandes sueños es poder pasar un mes en Italia comiendo. No fue un mes, sino una semana lo que estuvimos en Nápoles pero eso me bastó para confirmar que éste fue uno de sus viajes que voy a atesorar por mucho tiempo (sobretodo en las caderas después de incontables gelatos, platos de pasta y pizza)./ My biggest dream in life is not a Lamborghini or a huge house next by the sea, but to spend a month in Italy eating. It was not a month, but we had a week in Naples that was enough to confirm that this was one of those trips that I will treasure for a long time (especially in my hips after countless gelatos, pasta dishes and pizza). Me cuesta trabajo comenzar a describir mi amor por Italia (específicamente por Nápoles), pero desde siempre ha sido un país que me ha llamado la atención y que de alguna manera me recuerda mucho a mi México: el caos en las calles, la calidez de su gente, los rituales casi sagrados alrededor de la comida (en Nápoles hay comida prácticamente en todos los sitios) y la importancia de la “mamma”./ It’s hard for me to start describing my love for Italy (specifically Naples), but it has always been a country that has caught my attention and that reminds me a lot of my dear Mexico: the chaos in the streets, the warmth of its people, the almost sacred rituals around food (there is food practically everywhere in Naples) and the importance of «la mamma». Creo que toda la humanidad estamos en deuda con Nápoles por muchos años debido a la invención de la pizza. Y sí, la pizza de Nápoles de verdad es lo suficientemente maravillosa como para que Julia Roberts haya encontrado en ella el remedio para superar una ruptura amorosa en la película “Comer, Rezar y Amar”. / I think that all the humanity is indebted to Naples for many years due to the invention of pizza. And yes, pizza in Naples is wonderful enough that even Julia Roberts found in it the perfect remedy to cure a broken heart in the movie «Eat, Pray and Love». Sin tener conocimiento previo del mapa de Nápoles, tuvimos la suerte de quedarnos en Vía Toledo, una de las arterias principales de la ciudad, en un apartamento reformado e iluminado con prácticamente todas las opciones cercanas (tiendas, restaurantes, metro, bares, etc.). 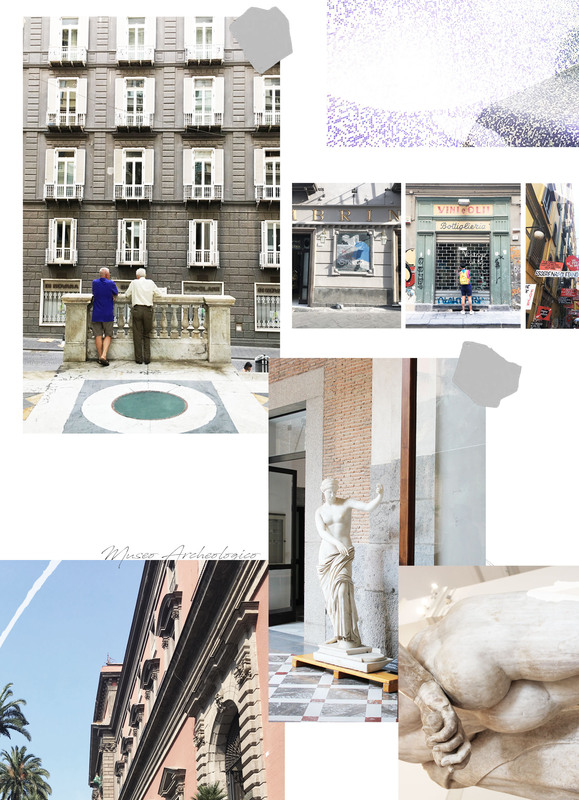 Puedes encontrar el apartamento AQUÍ./ Without having previous knowledge of Naples, we were lucky to stay in Via Toledo, one of the main streets of the city, in a renovated and illuminated apartment with the bare necessities around (shops, restaurants, metro, bars, etc.). You can find the apartment HERE. Muchas personas me advirtieron sobre los peligros y el caos de Nápoles, y sinceramente nunca tuve temor pero si mucha curiosidad por ver si las historias del terror que se contaban sobre “la cittá di Napoli” eran exageradas. No puedo hablar por todo el mundo, pero soy un ente difícil de sorprender respecto a ciudades caóticas y sobretodo después de haber vivido en varios lugares de México. Pero no, no todas las historias que se cuentan sobre Nápoles (ni sobre México) son ciertas, aunque un poco de precaución en según que sitios es más que suficiente (sentido común, vamos). Es verdad que Nápoles a diferencia de otras ciudades italianas presenta un carácter más revoltoso y desordenado, pero es precisamente esto lo que le da su encanto./ Many people warned me about the dangers and chaos of Naples, and sincerely I never had fear but I was very curious to see if the stories of terror that were told about «la cittá di Napoli» were exaggerated. I can’t speak for everyone, but I am a difficult entity to surprise about chaotic cities and especially after having lived in several places in Mexico. But no, not all the stories that are told about Naples (nor about Mexico) are true, although a little caution in some areas is more than enough (call it common sense). It is true that Naples, unlike other Italian cities, has a more unruly and disorderly personality, but it is precisely its charming characteristic. *Gino Sorbillo: Probablemente la mejor pizza que he comido en mi vida (o una de ellas). Haz espacio para el medio kilo de mozzarella di buffala./ Probably the best pizza I’ve eaten in my life (or one of them). Make room for half a kilo of mozzarella di buffala. *Tandem: Un restaurante completamente dedicado al ragú napolitano y otra experiencia celestial./ A restaurant completely dedicated to Neapolitan ragú and another heavenly experience. *Pizzeria Vesi San Biagio: Pedir la pizza margherita (sólo mozzarella, albahaca y tomate) es imprescindible, después habrá tiempo para las opciones más complejas./ Order margherita pizza (the one with mozarella, basil and tomato) is essential, you’ll have more time for more complex options later. *Pasticcerie Leopoldo: Me parece que los postres napolitanos no han obtenido la suficiente gloria que merecen./ It seems to me that Neapolitan desserts have not obtained enough glory, they’re too good! *Centro Storico: El centro cultural de Nápoles con sorpresas prácticamente en cada esquina./ The cultural center of Naples with surprises practically everywhere. *Posillipo: Tengo la fortuna de contar con una amiga de familia Napolitana y digamos que gracias a ella nuestra experiencia en Nápoles fue 100 veces mejor. El barrio de Posillipo en las colinas de la ciudad tiene las vistas más hermosas (con todo y el Monte Vesubio incluido)./ I am lucky to have a friend with Neapolitan family and I would say that thanks to her our experience in Naples was 100 times better. Posillipo neighborhood in the hills of the city has the most beautiful views (with everything and Mount Vesuvius included). *Chiostri di Santa Chiara: Un claustro hermoso salpicado con frescos en colores pastel y azulejos./ A beautiful cloister dotted with frescoes in pastel colors and tiles. *Pompeya: Si estás en Nápoles, vale la pena dedicar un día entero a visitar Pompeya. Toma el tren desde la estación Garibaldi y en 45 minutos estarás en uno de esos lugares que guardan las historias más maravillosas del mundo. 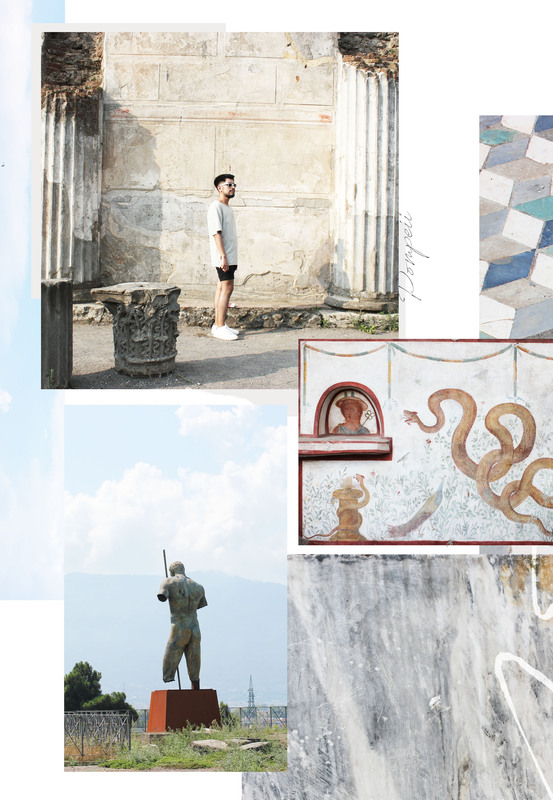 Me cuesta trabajo describir mi experiencia en lo que fue una de las ciudades romanas más importantes de la historia, totalmente recomendable./ If you’re in Naples, it is worth spending a whole day visiting Pompeii. Take the train from Garibaldi station and in just 45 minutes you’ll be in one of those places that keep the most wonderful stories of the world. I can not describe my experience in what was one of the most important Roman cities in history, totally recommended. *Museo Archeologico di Napoli: También recomendable, sobretodo después de visitar Pompeya ya que en este museo se guardan muchos de frescos y piezas de la antigua ciudad romana./ It is also recommended, especially after visiting Pompeii since many frescoes and pieces of the ancient Roman city are kept in this museum. I would love to visit Naples one day and Pompei. Naples seems similar to Sicily. And I’m gonna confess I’m not a big lover with Italian restaurant. I just feel like its always the same dishes. Solo pienso en volver para poder admirarme y comer jajaja. Italia es maravillosa, definitivamente pienso igual que tú me sorprendió mucho s calidez y también los ruidos de la calle, sin duda Italia es un destino que podría repetir incontables veces. Stef, muchas gracias por pasarte. 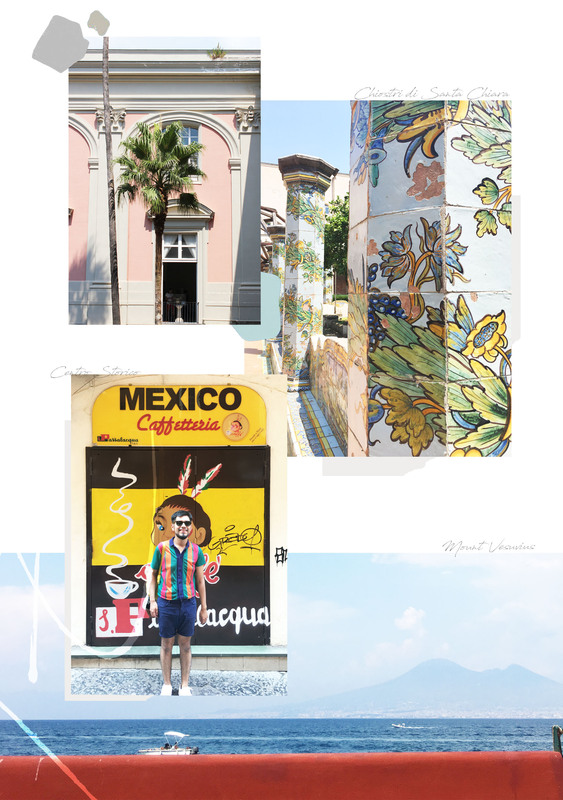 Gorgeous photos…and I love how you found that Mexico place to pose by. :) Great colouful outfits btw, perfect for summer. Your collage art is always impressing, I love your photography. 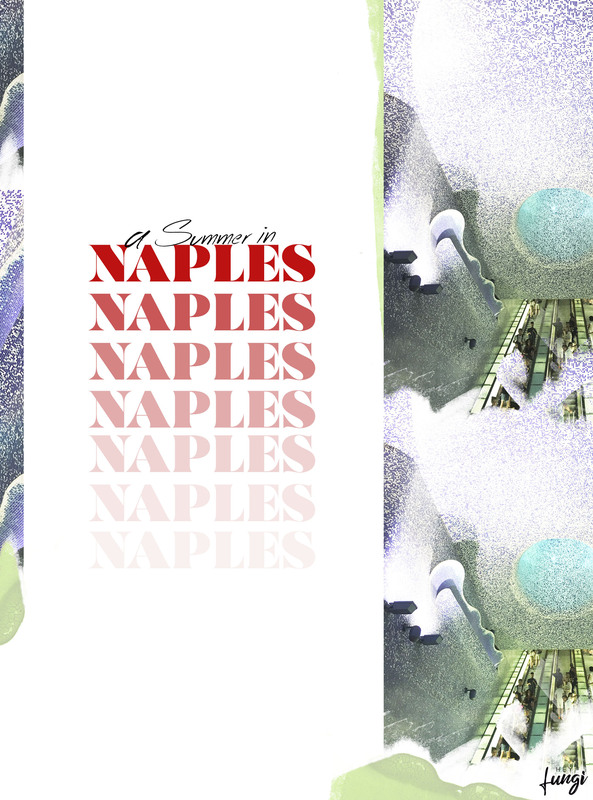 I think I remember hearing some things about Naples, how it’s chaotic and what not…but glad to hear that your experience was a positive one. It seems like you had a great time. I haven’t visited Naples yet but I hope some day I’ll get the chance. Hey Ivana, hope everything is going well with you! Oh my what a great trip. I love your snaps of the city it looks lovely. And I bet the food is amazing. Yes people always warn of pick pockets in Paris but I was not really concerned. I am from NY so know how to carry myself. I need to take my photos of Paris itself but I am always so busy with FW or I am filming. I need to go for two weeks haha. Yes it would be great to meet up in Paris next fall for FW!! Thank you so much Allie! Hope you had fun in Paris! I hope you have lots more travels in Italy! Now, I’m off to go grab a pizza because I just can’t help it after reading your post hahah! Hey Radi, yes! I forgot about my diet for a few days but on the other hand we walked so much haha! Y sí, la pizza de Nápoles está a otro nivel, yo ahora cada pizza que pruebo la comparo con esa jaja! Love the article, def. should visit there soon. Napoli is one of my fav cities, here in Italy: yes it’s pretty cahotic confronted with other cities (especially like Milano) but it’s full of wonderful things to see and vitality! Anyway seems you really enjoyed your time in Napoli and your guide is very useful and complete, especially the last tips! Hey there, hope everything is going well! Yes, I totally feel you, I’ve been in other places in Italy and Naples was such a different experience but I enjoyed it a lot! Thanks for sharing your experience with me! A whole month in Italy would be amazing! I am a huge fan of Italy as well and of course the food. Reading your post made me seriously hungry – need to visit Naples soon! We have been to Italy many times from Venice to Rome but we have not been to Naples yet! Have a great weekend, Fungi! When I asked him about Sicily (because I’m obsessed with The Godfather :p) He told me that I should try the cannoli as it is a Sicilian staple. But he also warned me that «cannolis are calorie bombs» haha Have you tried that one? Thanks for all the love in your comment, Tins! Haven’t been in Sicily (still on my bucket list) but I have heard about the cannoli and it is on my list of things to try soon haha! I would never skip Napels! I’ve heard the food there is beyond amazing! Thanks for sharing your experience! Thank you for sharing your wonderful Naples! I imagine you ate delicious pizza every day and enjoyed around beautiful scenery! You had so fantastic time!! I haven’t seen ‘Eat Pray Love ‘, because I can’t eat a lot. However I just watched the trailer, it is so beautiful and I want to see it soon!! Hey Ivonne, hope you’re having a nice week. So you have been in a lot of places in Italy… you’re very lucky! And yes, Naples is cheaper compared to Rome or to Firenze or Venice (not that much but there is a difference, especially in accomodation). Esta es una de las tantas ciudades que tengo pendiente de Italia! Qué maravilla ha de ser… yo creo que si viviera en Italia sería sin duda y a mucha honra, obesa mórbida feliz, hahaha! Me guardo este post por si algún día viajo hacia Nápoles, aun que primero creo que será Portugal! Hola Paz! Si ya te has visitado las ciudades obligatorias de Italia ahora tienes que ir al sur, sé que te gusta la pizza así que te va a encantar este lugar jaja! Nada más inspirador que entrar a tu blog, ojalá pronto pueda visitar Italia, me encantan tus imágenes amigo, sueño al verlas. Wow, everything looks so nice!